I’m disturbed by all suicides. This is such a problem in our society now. Something is so very, very wrong. But what I want to write about tonight is the alarming rate of medical student, resident, and physician suicide that seems like an epidemic now. I know medical school is stressful. It has been since whenever it originated. I know you have to be very intelligent, driven and more often than not, they are perfectionists. You have to have a great drive, intelligence and accomplishments to even come close to being accepted by a medical school. Of course they have to be, look at what they will be doing. But something is not going so right in medical schools when many doctors depression starts there. I feel I know some of the reasons for physician suicide. Being a doctor is not what it once was. They often don’t have respect, are subject to high malpractice rates, are always under the threat of being sued, they feel they have to hide any depression therefore they don’t seek help, having to see too many patients, insurance calling the shots on many things. And I don’t see anything getting any better at all with our so called healthcare reform. As a matter of fact, I see it worsening. I know I do a lot of writing about medical student and physician depression and suicide, but it’s because it hits me right into my heart because my daughter was a medical student when she took her life. While I don’t pretend to even know whether the stress of med school had anything to do with it, I can’t help but wonder if things could have been easier for her to seek help without threat of losing everything she put into it. I wanted to post a couple of articles of physician suicide that have happened within weeks of each other. Then I want to post a blog post from Pamela Wible MD who is trying to move mountains in helping with this problem. She has her own practice that is MD and patient friendly and has started doing things differently than what has been traditionally done. She has retreats for doctors who are burned out and depressed. She holds seminars on how to form a better practice so an MD can feel human again instead of feeling like a machine. She’s been on multiple TV programs, TED talks, and newspapers online, and has her own blog and much more. I know there is more to come from her. Much more. My daughter Kaitlyn’s picture is on her wall beside her desk….all the way in Oregon. Thank you Pamela for all you do. 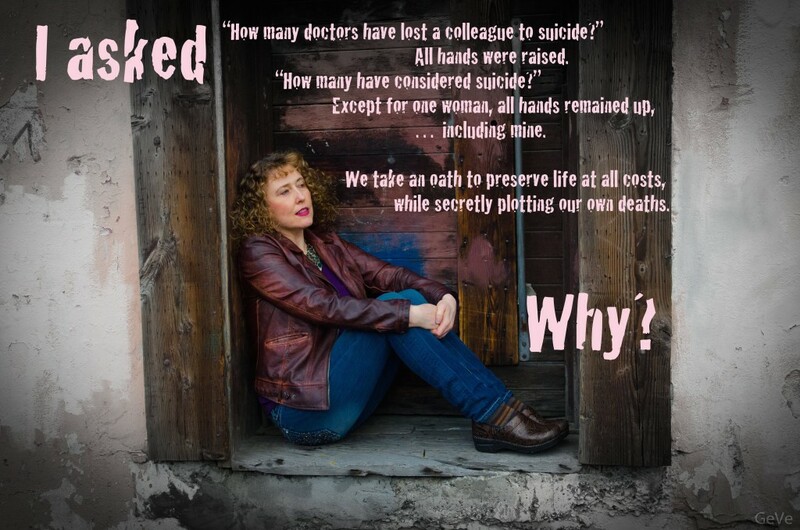 For every doctor who dies by suicide, friends, family, and patients are left to wonder why. If you are moved by these letters, please watch and share my TEDx talk on physician suicide. Read more letters here. Here is the link to Pamela’s blog post so you can read the responses and get an even better idea of how doctors and med students are feeling. Here I am once again, to seemingly come on my blog and brag about my book. But I can honestly say, that though it may seem like I’m bragging, I am not. The reason I ever write about my book or post my reviews is because it drives home the fact that what happened to my daughter has happened to so many medical students, residents, doctors and young people in any station in life. And unfortunately, there are many more depressed students out there scared to get help and we must do something about it. And by doing this hopefully more can be done about this problem. I feel good that it is getting good reviews and though it is no longer in the top 10 of its category, it is still in the top rated section in its category. I hope and really think that my book does Kaitlyn justice and with the information I learned that I added in there that it can help somehow. So many of Kaitlyn’s friends can’t even bear to crack open the book because they can’t bear to read about her death. And I so understand that. But also, there is so much of her beautiful life in there that will live on as long as the book survives. And of course she will live on in our hearts. At least on my dying day, if I have time to think before I go, I will have known that though I have not done great feats in this world I have no doubt that I did do some of the most important things a person can do; I have loved my children, my husband and family with all my heart and did the best I could for them, though I was far from perfect. Love has always been given freely in my house. I have loved my family. And I have written this book and if one person can be saved from it, it will have served its purpose. But I hope my book spurs on more action in some way. Here is my latest review from yesterday 8-25-14 and a link to the rest of the reviews. As a physician who has lost her physician son to suicide, I related to this book on many levels. Rhonda Elkins is the exceptional grieving parent who can transform her own tragic loss into a life raft for others. The theory she proposes about the risk factors for suicide that are inherent to the gifted is well-worth further inquiry and study. My son, gifted as well, struggled with clinical depression for many years. Hie, like Kaitlyn, lived his life passionately and full-force, always running rather than walking into the next new challenge or endeavor, always a step or two ahead of his peers. Is there something about the combination of talent and vulnerability that draws these young people to medicine? Is there something about medical academia that hails the talent but spurns the vulnerability? As a practicing psychiatric physician of 30 years, I can confidently state that both talent and vulnerability are necessary for the competent and compassionate practice of medicine. Kaitlyn and Greg are huge losses, not only for Rhonda and myself, but for all those who will not benefit from their intellect or their compassion. My heartfelt thanks to Rhonda Elkins for having the compassion and the talent to speak to us about her loss, and our loss. My hope is that it will remind us to not only recognize, but to embrace and nurture, the vulnerabilities and special needs of our gifted youth. I wanted to post this latest review of my book by Dr Ralph Caruana who once taught at Wake med where Kaitlyn went to med school. He makes many good points, especially about med students. This is a beautifully written book about the ultimate family tragedy: the suicide of a young person, who was loved, full of promise and seemingly without any dark clouds hovering over her. I approached this story from many angles: as a parent, as a medical educator and as a former resident and faculty member at the medical school Kaitlyn attended. Sad to say this is by no means the first time that I have heard such a story and in fact I have watched this scenario unfold several times during my long career in academic medicine at three medical schools. Medical trainees are at much higher risk for depression and its sequelae than are other similarly aged demographic groups but this is not a book about the stresses of medical training or a call for educational reform. This is a book about experiencing loss, understanding loss and trying to work through loss. Kaitlyn’s life history did not put up any red flags suggesting that she could be suffering from depression. Her mother and father are highly sensitive, involved parents who had maintained excellent communication channels with their daughter. They had enough education and life experiences to be aware that depression exists in young people and that it can be a very serious matter. Kaitlyn never communicated to them or anyone else that she was suffering from depression yet the note she left behind makes it clear that depression prompted her actions. Kaitlyn’s high achievement, high energy, loving family relationships and buoyant personality did not suggest to anyone that she was “at risk”. This book chronicles a family’s experience of living through a devastating loss. The grief, the sense of emptiness and the endless search for answers that never materialize are eloquently put before the reader. Besides telling her story Rhonda Elkins issues a call for awareness and action that could better identify depression in the young and provide the opportunity for effective, early treatment. This book is essential reading for parents, educators and those in the caring professions who work with adolescents and young adults. When Kaitlyn was 15, she applied to the North Carolina School of Science and Math. It is a boarding school in the NC school system in Durham for the mathematically and scientifically gifted. Room, Board, Food, books…..all free and anyone that graduated from there got a free scholarship to any university they were accepted into in the NC university system. She wanted this so much, but I could not bear the thought of her living away from home 3 hours away from me at 16 to 18 years of age. But I was willing to do it…for her. She was accepted at this highly competitive to get into school (they only accept about 300 a year out of thousands of applicants). But alas, Kaitlyn wanted to come home after 2 weeks even though she was doing well academically….she was just so very lonely. So I went and got her myself and she picked back up at her regular high school just where she left off. If you want to know somewhat about the kind of child/teenager/and young woman my daughter was, please read this letter of recommendation that someone wrote for her for her application to that school. It speaks volumes about Kaitlyn’s personality and intellect.